At the end of the Hurtle in Fairland Park all entrants get a free t-shirt, drink and donut, photo, and a medal for children. Places are limit so early booking advised as the previous event was booked out. Its the Harringay Lantern Parade on Saturday the 28th of November and in preparation for that there are free lantern making workshops this Friday the 20th and Saturday the 21st of November. The Friday workshop is 3:30pm to 8pm at the Falkland Centre on Frobisher Rd by North Harringay Primary School. There will be a food and drink stall at the workshop with all money raised going to the school’s PSA. Come along after school to make a lantern and have cakes, snacks and hot drinks, or come later on in the afternoon/evening for pizza and beer and lantern making. All materials are provided free – all you have to do is turn up any time and make a lantern, and enjoy some refreshments. The Saturday workshop is 12:30 – 6pm at the Salisbury Pub on Green Lanes. Everyone is welcome to pop in any time, all materials and guidance to make a lantern will be provided and everything is free. We will be in the back room of the pub, so come along, grab some food and drink and create a beautiful lantern. Thanks for the successful movie night! Thank you everyone who came along and made the movie night such a success. 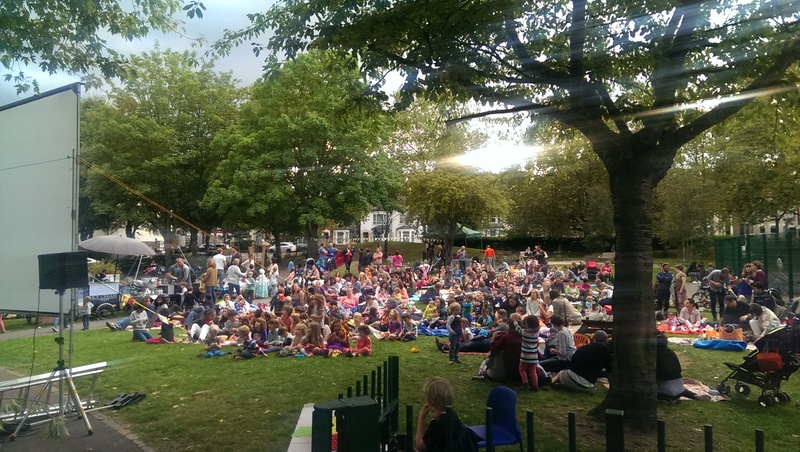 We were blessed with fantastic weather and despite a couple of technical hiccups everyone had a great time. 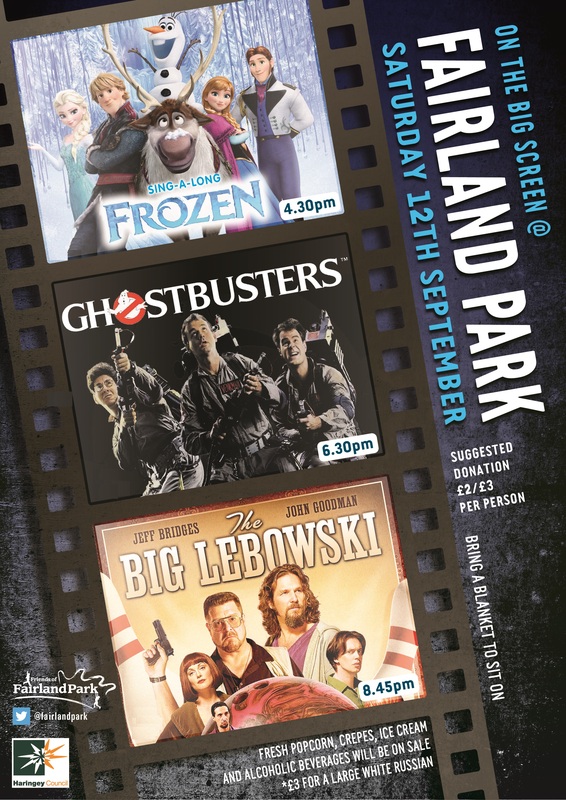 Free open air movies return to Fairland Park on Saturday the 12th of September – a triple bill starting with Frozen at 4:30pm, followed by Ghostbusters and then The Big Lebowski. This year with a larger screen, and more reasonably priced food and alcoholic and nonalcoholic drinks (sales go towards paying for the movie screening so please buy things). Bring warm clothes and something to sit on. Will go ahead unless its _really_ wet, if it looks damp bring something dry to sit on. If you bring a chair please be at the back or sides so everyone can have a good view. 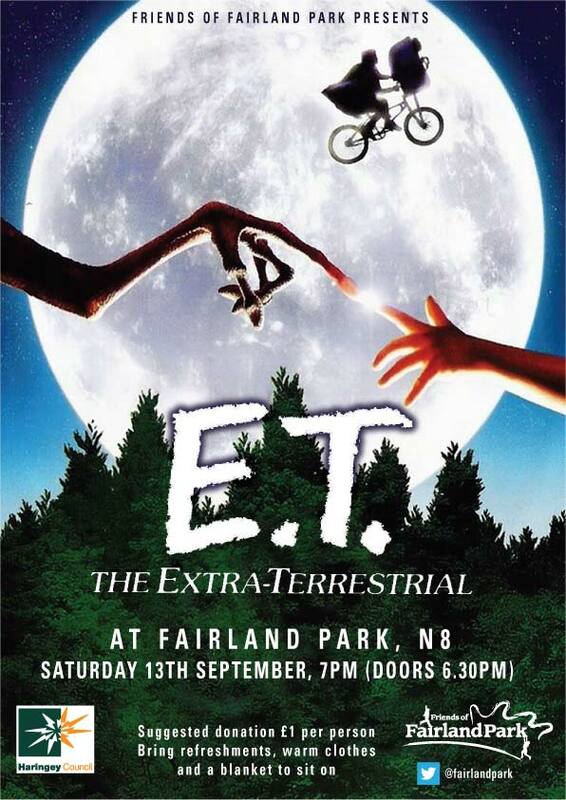 Open air cinema returns to Fairland Park this weekend! !